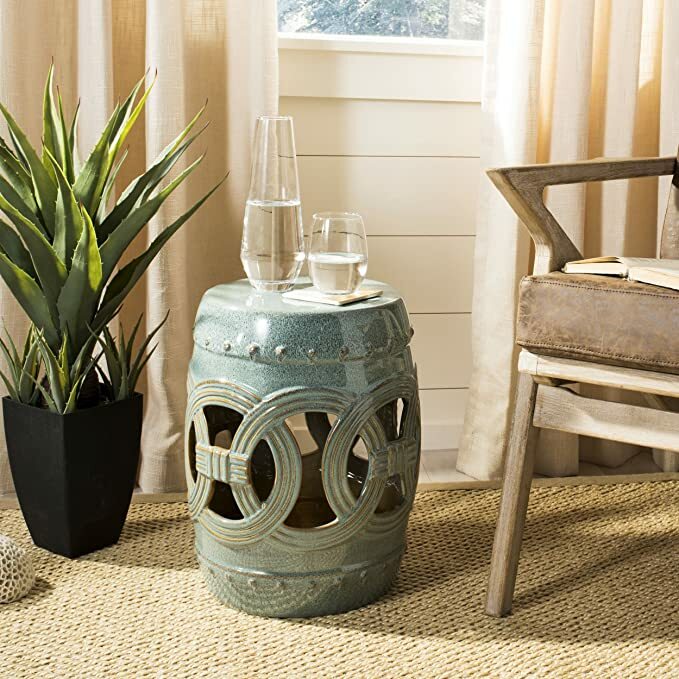 Add a classic accent your garden, patio, deck, or any indoor room with the Safavieh Castle Gardens Collection Medallions Light Blue Ceramic Garden Stool. Handmade of quality ceramics, this stool can be used outside or inside as an extra seat, foot rest, small table, plant stand, cocktail table and anything else you can think of. This garden stool is sure to be the talk of your next party. This garden stool measures 13 Inch wide by 13 Inch deep by 18.5 Inch tall. 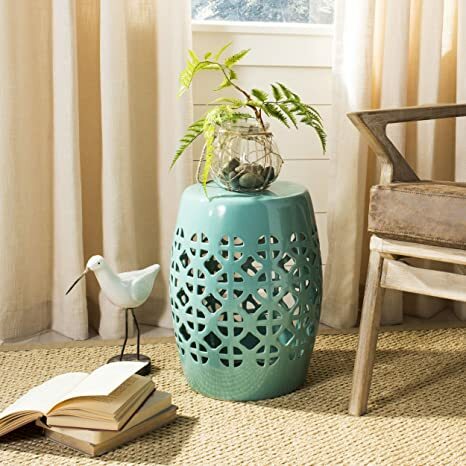 Add a classic accent your garden, patio, deck, or any indoor room with the Safavieh Castle Gardens Collection Quatrefoil Light Blue Ceramic Garden Stool. Handmade of quality ceramics, this stool can be used outside or inside as an extra seat, foot rest, small table, plant stand, cocktail table and anything else you can think of. This garden stool is sure to be the talk of your next party. This garden stool measures 13 Inch wide by 13 Inch deep by 18 Inch tall. 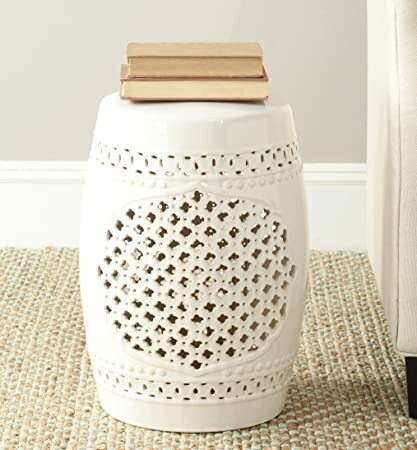 Add a classic accent your garden, patio, deck, or any indoor room with the Safavieh Castle Gardens Collection Circle Lattice White Ceramic Garden Stool. Handmade of quality ceramics, this stool can be used outside or inside as an extra seat, foot rest, small table, plant stand, cocktail table and anything else you can think of. This garden stool is sure to be the talk of your next party. This garden stool measures 13 Inch wide by 13 Inch deep by 18.5 Inch tall. 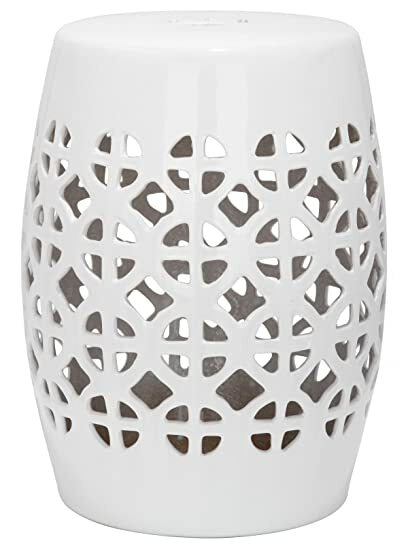 Add a classic accent your garden, patio, deck, or any indoor room with the Safavieh Castle Gardens Collection Quatrefoil Cream Ceramic Garden Stool. Handmade of quality ceramics, this stool can be used outside or inside as an extra seat, foot rest, small table, plant stand, cocktail table and anything else you can think of. This garden stool is sure to be the talk of your next party. This garden stool measures 13 Inch wide by 13 Inch deep by 18 Inch tall. 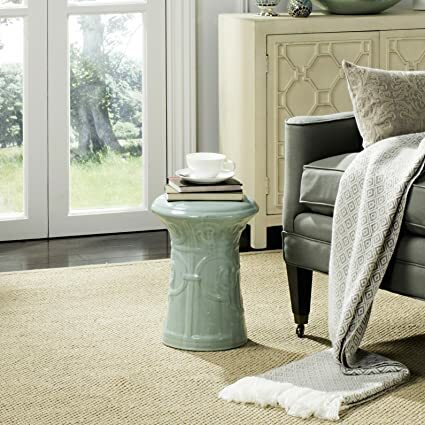 Incredibly versatile, the Lacey indoor-outdoor garden stool in light blue adds a feminine touch to transitional spaces as a seat or side table. A pierced quatrefoil motif inspired by couture lace fashions adorns this pretty glazed ceramic accent piece. 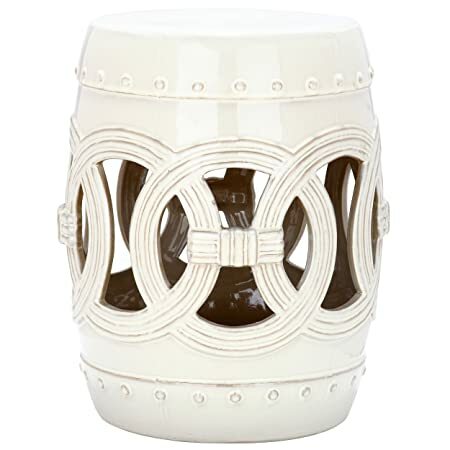 Add a classic accent to your garden, patio, deck or any indoor room with the Safavieh Castle Gardens Collection Knotted Rings White Ceramic Garden Stool. Handmade of quality ceramics, this stool can be used outside or inside as an extra seat, foot rest, small table, plant stand, cocktail table and anything else you can think of. This garden stool is sure to be the talk of your next party. This garden stool measures 13 -Inch wide by 13 -Inch deep by 17 -Inch tall. 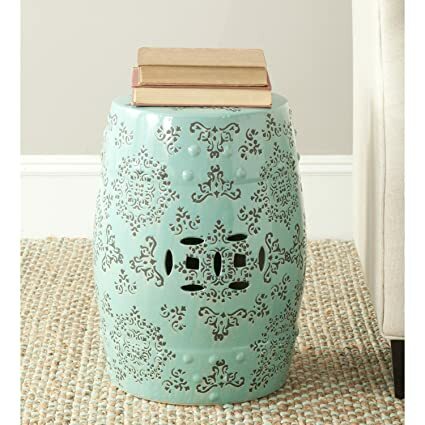 Add a classic accent your garden, patio, deck, or any indoor room with the Safavieh Castle Gardens Collection Imperial Garden Light Aqua Ceramic Garden Stool. Handmade of quality ceramics, this stool can be used outside or inside as an extra seat, foot rest, small table, plant stand, cocktail table and anything else you can think of. This garden stool is sure to be the talk of your next party. This garden stool measures 12.2 Inch wide by 12.2 Inch deep by 15.5 Inch tall. Add a classic accent to your garden, patio, deck or any indoor room with the Safavieh Castle Gardens Collection Knotted Rings Blue-Green Ceramic Garden Stool. Handmade of quality ceramics, this stool can be used outside or inside as an extra seat, foot rest, small table, plant stand, cocktail table and anything else you can think of. This garden stool is sure to be the talk of your next party. This garden stool measures 13 -Inch wide by 13 -Inch deep by 17 -Inch tall. 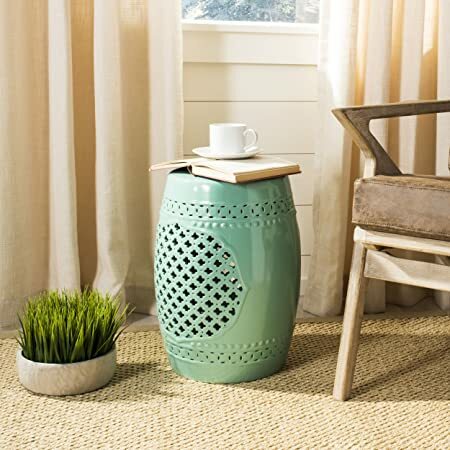 Add a classic accent your garden, patio, deck, or any indoor room with the Safavieh Castle Gardens Collection Lattice Coin Gold Ceramic Garden Stool. Handmade of quality ceramics, this stool can be used outside or inside as an extra seat, foot rest, small table, plant stand, cocktail table and anything else you can think of. This garden stool is sure to be the talk of your next party. This garden stool measures 13 Inch wide by 13 Inch deep by 18.5 Inch tall. 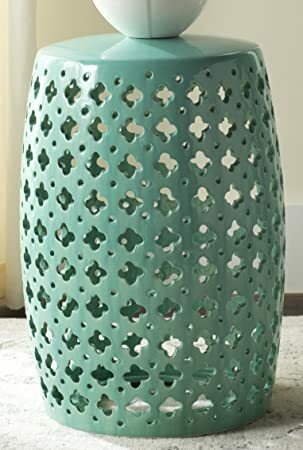 Add a classic accent your garden, patio, deck, or any indoor room with the Safavieh Castle Gardens Collection Circle Lattice Light Blue Ceramic Garden Stool. Handmade of quality ceramics, this stool can be used outside or inside as an extra seat, foot rest, small table, plant stand, cocktail table and anything else you can think of. This garden stool is sure to be the talk of your next party. This garden stool measures 13 Inch wide by 13 Inch deep by 18.5 Inch tall.